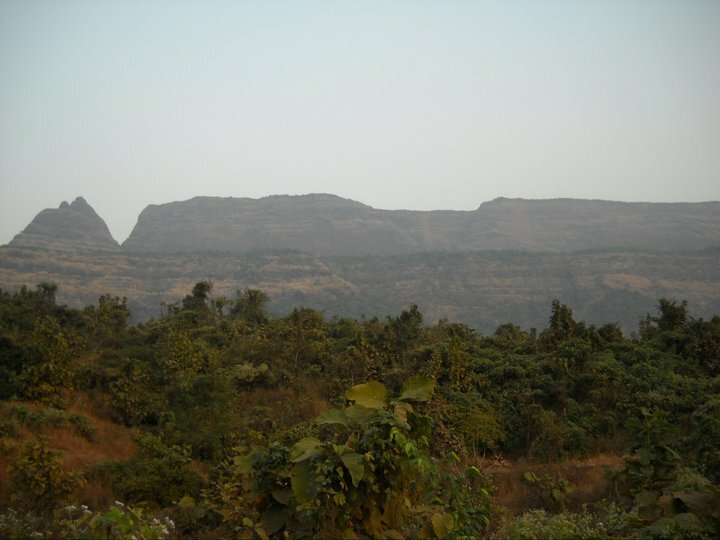 Prabalgad is located on a plateau between Matheran and Panvel at approx 2300 feet above sea level. The fort is visible from the Mumbai Pune highway but lacks in a good water resource. Shivaji’s forces attacked the fort then governed by Kesar Singh, a Mughal sardar and the fort was known as Muranjan then. How to Reach: Reach Panvel and take bus or rickshaw to thakurwadi where the trek starts. From thakurwadi it takes approx 1.5 – 2 hrs to reach prabalmachi, there are some villagers residing here. There are some rock steps before you reach prabalmachi, which are now cemented by the villagers. On the right there are idols of Lord Ganesh and Hanuman carved out in the rocks. After reaching the plateau, there is a very good view of the valley on the right. From prabalmachi there are two ways, the way on the left goes towards Kalvantin durg and the other one goes towards Prabalgad. It takes another 1 hr to reach the top. The fort is quite vast you will need at least 2 hrs to spend on top. There are some difficult patches on the way from prabalmachi towards the fort which might be difficult during the monsoon. There was landslide near the fort base when we reached and it was a bit difficult to walk on the scree. It was a rocky after that and was taking a lot of effort to climb. Essentials: Carry water, rations, and other regular trekking accessories.